Ready to go beyond the typical corporate gift? 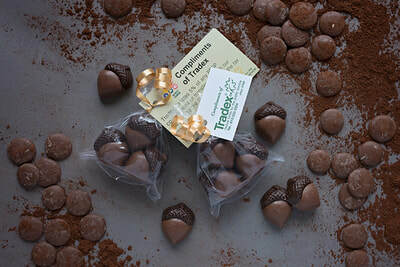 ​At Village Treats, we’ll work with you to bring your corporate gift idea to life. We promise: no dull gift that’ll get tossed into your employees’ garbage can. Instead, they’ll be thrilled to get a gift filled with flavour and fun. Our box sets are popular items for corporate gift-giving! We provide a range chocolate box set options so that your gift receivers will beam with chocolate adoration. Box sets can include milk chocolates, truffles, our popular Northern Nuggets, and assorted box sets with a mix of nut cups, meltaways, fruit creams, chocolate mints, and caramels. The best part? We can custom package your boxes! 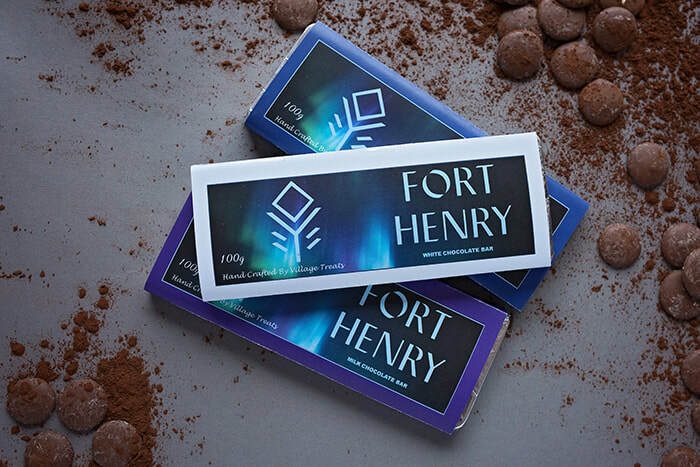 Working with our graphic design team through Staples, we’ll create a custom package design that adds Pinterest-worthy detail to your gifts including labels, stamped logos and custom colours. 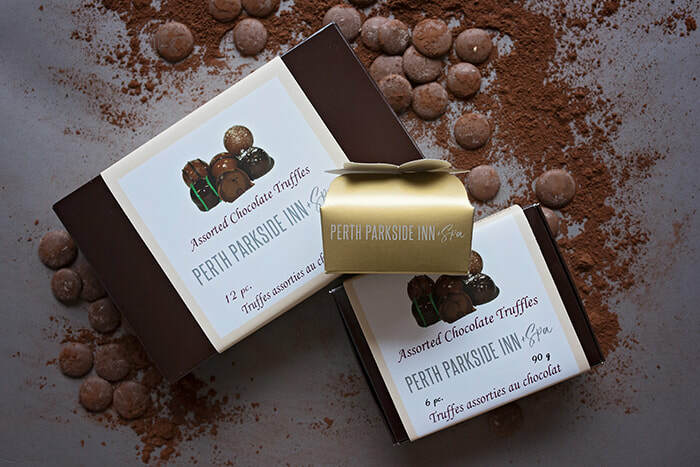 Perfect for: holiday gifts to clients, dessert favours at parties and galas, wedding favours. Hosting a conference or event where you’d love to go all out with your branding? Then you’ll love what we can do with custom molds. 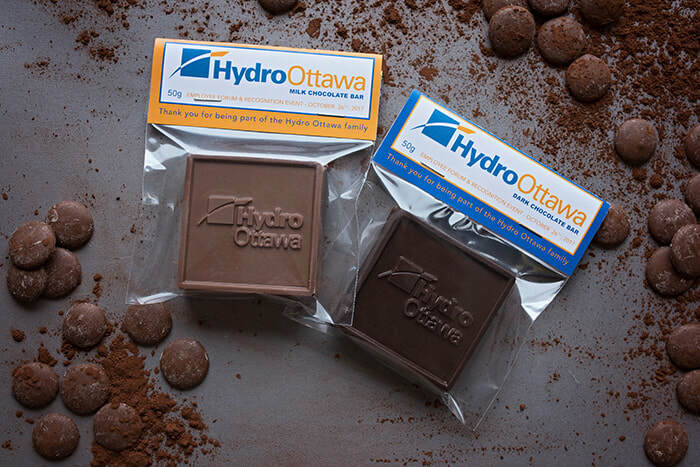 Whether you’re hosting an event, gaining attention at tradeshows or want to impress clients with custom creations, we can take your company or organization logo and create a custom chocolate mold that gets attention. We’ve done custom chocolate bars, healthcare-related molds, company anniversary logo creations and more. It’s definitely a taste-worthy way to get noticed. Perfect for: Holiday party handouts, conference swag pieces, dinner-place setting at gala event, thank you gift to clients, trade-show handouts. Our gift baskets are your way of telling your employees and clients just how much they mean to you – genuinely. Working with your budget, we’ll craft together a custom gift basket that will include our chocolate and some extra goodies from partnering businesses. Perfect for: holiday and thank-you gifts to clients, employees, partners and subcontractors. Step 1: Reach out to us! Give us a call, email or pop by our shop in Lanark to talk about your ideas. We’ll discuss options, packaging, timelines and budget and carve out a plan that aligns with your corporate gift goals. 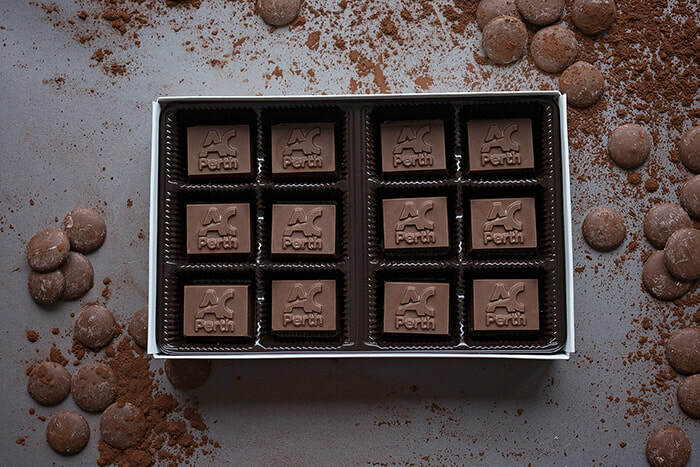 We’ll give you options for how you can package your chocolate gifts. From creating custom labels to personalized boxes, we’ll work with the graphic design team at Staples and implement the design order on your behalf. Once you finalize your decision, you’ll place an order by filling out a form we provide to you. We generally require approximately two weeks to get an order completed (depending on the time of year). Before we go to chocolate press, we’ll send you a sample image of the custom mould or basket along with any packaging items to review. We’ll ensure you’re totally happy with the creation before it goes to production. We stay in touch with you throughout the process to ensure we’ve produced a gift you’ll be proud to hand out. Step 5: Pick up or Delivery? Once your order is complete, you can either come to our shop in Lanark to pick up the order, or we can have it delivered to your location. Ever see a child open up a gift on Christmas morning? That’ll be what you witness when you hand out your gifts to your colleagues, clients and friends. You’ll soon become their BFC (Best Friend with Chocolate). Want to learn more? Connect with us to talk about your ideas and how we could work together.